This Washington Avenue house was boarded up after being officially declared a criminal nuisance property in Selbyville, near Polly Branch Road. 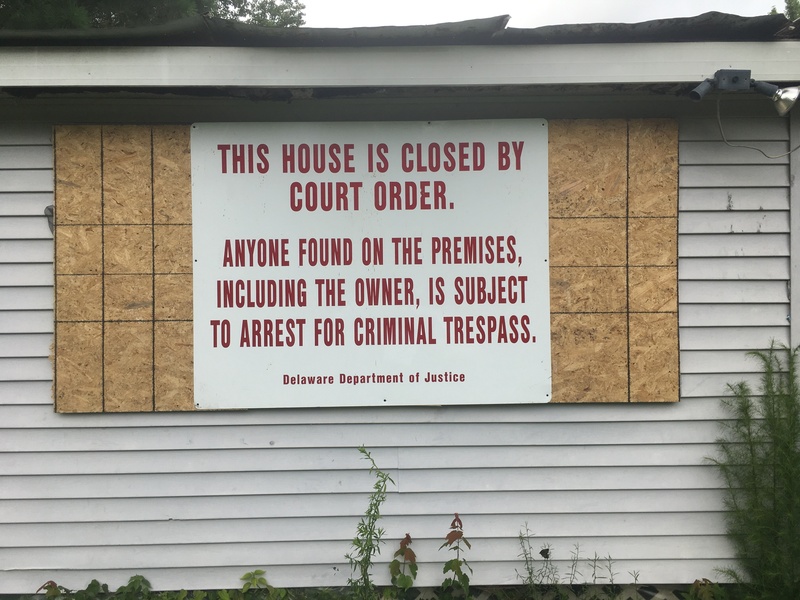 A house near Selbyville that had been the site of multiple drug crimes and police calls since 2014 was boarded up as a result of work by the Department of Justice (DOJ) and Delaware State Police (DSP) to deem it a criminal nuisance property. The property at 37920 Washington Avenue in Selbyville was known in the area as a location for drug purchases and had been the subject of police calls, searches and arrests, including an undercover drug buy and seizure of heroin, crack cocaine, marijuana, suboxone strips, cash and guns, over a three-year period. DOJ attorney Oliver Cleary filed a request with Superior Court in April 2018 that the property be declared a criminal nuisance, and in June 2018 a Superior Court judge granted the request and ordered the three tenants to be evicted. On July 31, DSP troopers and the DOJ Crime Strategies Unit served the final notice on the property and it was boarded up. As part of the court order, the property owner is to ensure no illicit activity occurs on the property and is prohibited from renting the property to anyone with a felony drug dealing conviction. The state’s criminal nuisance abatement act has been used repeatedly by DOJ over the last several years to address residential and businesses properties that have been found to be the location of ongoing criminal activity. DOJ investigator Mark Hawk of the Crime Strategies Unit participated in the investigation and eviction.